hashID is a tool to help you identify different types of hashes used to encrypt data, especially passwords. It’s written in Python 3 and supports the identification of over 220 unique hash types using regular expressions. 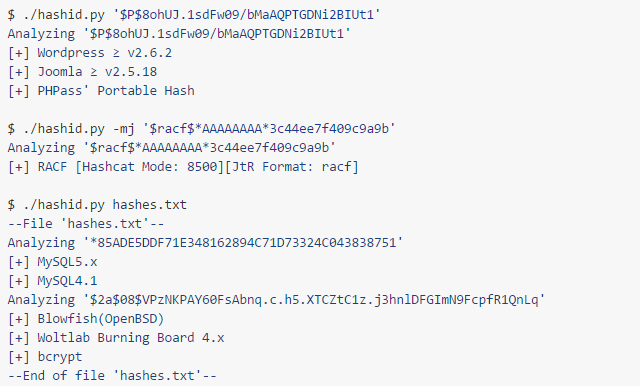 hashID is able to identify a single hash, parse a file or read multiple files in a directory and identify the hashes within them. hashID is also capable of including the corresponding hashcat mode and/or JohnTheRipper format in its output. There are other similar tools like hash-identifier, which is outdated and this claims to replace. And the original HashTag – Password Hash Type Identification (Identify Hashes) – which is even older. And to be fair, this hasn’t been updated since 2015 either so yah.